About 8 species, natives of the Old World. 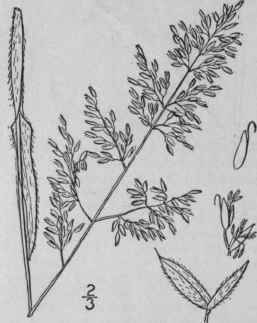 Type species: Holcus lanatus L.
Holcus lanatus L. Sp. PI. 1048. 1753. Softly and densely pubescent, light green, culms 1 1/2°-3° tall, erect, often decumbent at the base, simple. Sheaths shorter than the internodes; ligule 1/2"-1" long; blades 1'-6' long, 2"-6" wide; spikelets 2" long, the empty scales white-villous, the upper awn-pointed; flowering scales 1" long, smooth, glabrous and shining, the lower sparsely ciliate on the keel, somewhat obtuse, the upper 2-toothed and bearing a hooked awn just below the apex. In fields, meadows and waste places, Nova Scotia to Ontario and Illinois, North Carolina and Tennessee. Also on the Pacific Coast. Naturalized from Europe. Velvet Mesquite. Old White-top. Salem-, Rot-, Dart- or Feather-grass. Whites. Yorkshire-fog. White-timothy, Calf-kill. June-Aug.